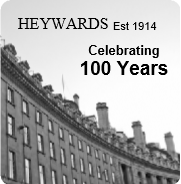 Heywards is a two-partner firm of Chartered Accountants, based in the heart of London's West End district. Established in 1914, we cater to the business needs of a large variety of enterprises ranging from private individuals & sole traders to substantial companies. We utilise modern technology including the very latest computer software & hardware and aim to provide a personal, prompt, efficient and also professional service at competitive rates with all our clients assured of partner attention. Our reputation is based on the quality and standard of the services we provide and staff members have a high standard of technical competence and personal skills.